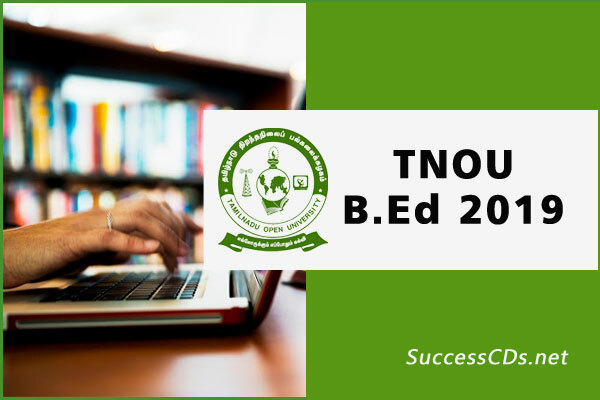 TNOU B.Ed Distance Education Admission 2019 - Tamil Nadu Open University (TNOU) is conducting the Entrance Examination for admission to B.Ed. Program for January 2019 Batch. Interested candidates can check all the details of TNOU B.Ed. Admission 2019 like application form, eligibility criteria, selection procedure etc from this page given below. The B.Ed., Program is offered through 10 Learner Support Centres approved by the Tamil Nadu Open University and recognized by the Nation Council for Teacher Education (NCTE) distributed in the State of Tamil Nadu. The B.Ed. Program (Distance mode) is of 2 years. However, the student teacher is permitted to complete within a maximum period of 5 years, after the enrolment. The medium of instruction for B.Ed. (Distance Mode) is Tamil and English. Application is common for both English and Tamil medium of B.Ed. Program. The candidates should have passed the UG degree examination in 11+1+3 or 10+2+3 stream; candidates who have direct UG Degree without +2 qualification/post-graduate degree without a UG degree are not eligible. PG Degree (5 years Integrated Course) under 10+2+5 or 11+1+5 pattern shall be considered for admission; but the marks obtained by the candidate in the first three years (major and allied) only taken into account for admission to the B.Ed.SE Degree Course.